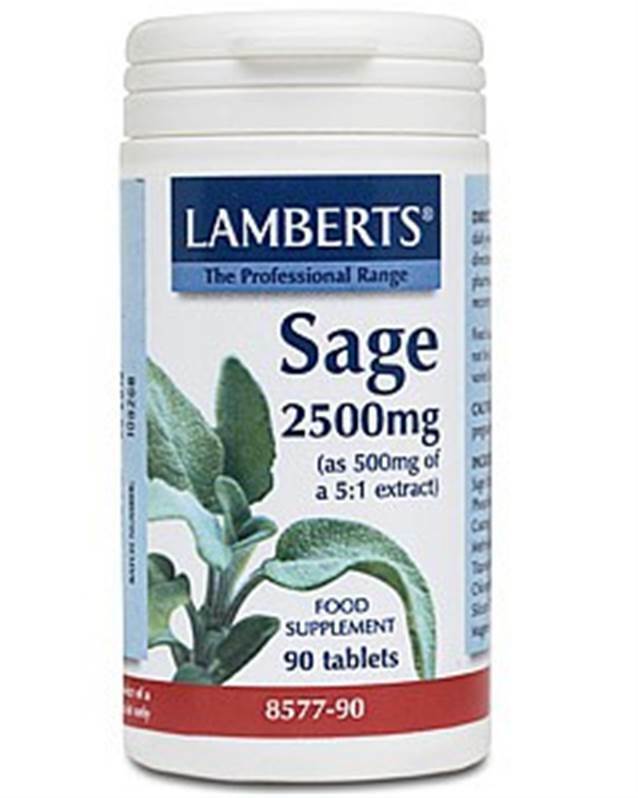 Lamberts Sage 2500mg health supplement is for hot flushes, excessive sweating, excessive salivation. Much more than just a culinary herb, sage has traditionally been associated with longevity, with a reputation for restoring memory in the elderly and has been used by herbalists for centuries for a variety of conditions. Carefully manufactured to have very low, insignificant levels of thujone – a naturally occurring, unpleasant compound. Sage has traditionally been associated with longevity, with a reputation for restoring memory in the elderly and practitioners have used sage for many years for the treatment of hot flushes, a use supported by some studies. Sage is considered to have mild phyto-oestrogen activity which means that whilst not chemically related, it does have some similarities to oestrogen. So whilst the herb cannot elicit a full oestrogen-like effect on the body it is able to bind to oestrogen receptors and this probably accounts for its use for women going through the menopause. The sage that Lamberts® uses in this product is a standardised extract which ensures purity and potency of the material. This is important with sage as the active compounds such as rosmarinic acid need to be present at a guaranteed level, whilst undesirable compounds such as thujone must be almost entirely excluded. Our high-grade sage extract has a guaranteed level of 2.5% rosmarinic acid and is probably the only sage extract available in the UK that has closely controlled, very low levels of thujone. DiCalcium Phosphate Cellulose Tablet Coating (Hydroxypropyl Methylcellulose Colours: Titanium Dioxide & Copper Chlorophyllin Glycerin) Silicon Dioxide Stearic Acid Magnesium Stearate.